Destiny II IQ Designer & 8550 Design Center – Baby Lock Destiny II & Brother 8550 owners will learn all of the creative options that are available in their IQ Designer & Design Center. 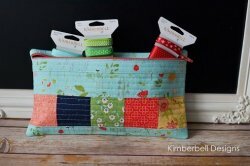 Kimberbell Club – Learn how to piece & quilt in the hoop and inserting a zipper with your embroidery machine. We will create this fun pouch and learn how to add your name and an inside pocket. These will be perfect for storing your Club USB stick and membership card. Bench Buddies – Create adorable petite pillows for every month of the year. These 8” and 5”x9” embroidered buddies are completely cute cuddled up on a bench or propped on a shelf for decoration.Join us each month to create a new pillow cover for every season and holiday. This month we will be making the April Chenille Bunny. Software Inspirations – Get creative with the patterns in BERNINA Embroidery Software. Even create your own patterns and send them to the machine for embroidery or stitching. 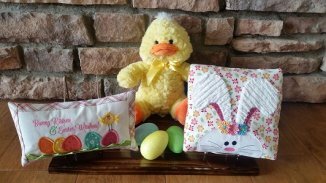 Hoppy Easter Bench Pillow – In this 3 part embroidery class we will be creating the darling elements that make up this 16”x38” Bench Pillow. Peek a boo bunnies, downy chicks, polka dot eggs & sprouting glitter carrots all have darling dimensional elements that join the parade of pretty pastel fabrics. Kimberbell Club – Use techniques such as cutwork and fringe embroidery to make this magnificent Easter Faberge Egg. 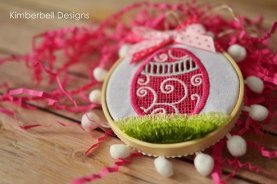 Once embroidered, the ornament can be framed in an adorable bamboo hoop and adorned with bows and trim. Fabric Covered Easter Basket – Transform an inexpensive woven basket into an adorable fabric covered carryall, notions basket or simply a pretty decoration. Embellish the lid with embroidery, applique or piecing that coordinates with your fabric and you can create baskets for any season, hobby, celebration or personality. We will just be constructing the basket in class, you will decorate the lid at home before class. So sign up soon. Bench Buddies – Create adorable petite pillows for every month of the year. These 8” and 5”x9” embroidered buddies are completely cute cuddled up on a bench or propped on a shelf for decoration.Join us each month to create a new pillow cover for every season and holiday. Software Inspirations – Explore CorelDRAW SE and learn how to create an intertwined, wrapped design to add dimension to your projects. Additionally, learn how to create monograms and eliminate overlaps in the monogram. Edge to Edge Quilting – Learn this new “Easy To Connect” quilting technique. Your embroidery machine combined with specially-designed embroidery files will make it possible to create edge to edge quilting using your home embroidery machine. So much fun! 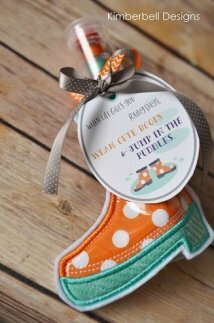 Kimberbell Club – When life gives you rainy days, stay inside and stitch a pair of darling rain boots on your embroidery machine. There are also printable PDF tags with encouraging phrases. Great for gifts. Solaris & Luminaire “You’re Sew Special” – Learn how to create these fun embroidery projects for your sewing room in the IQ Designer or Design Center. You will create a cute pin cushion, a handy sewing dish, & quilted scissor holder. 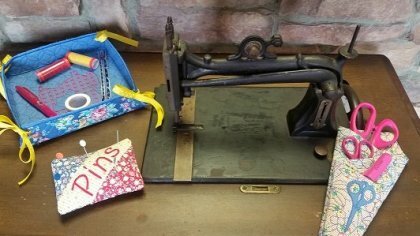 May 30th 10:00-4:00 FREE to Sewing Nook machine owners only.